I chose it as study after concluding that fine arts nor academic study were my cup of tea. Now I'm doing a bit of a mix of all three. A friend of mine told me of a friend of hers who was pregnant at the same time as I was, we got talking and turned out she was selling on Etsy. Check out katrinakaye.etsy.com! Etsy is my online shop. In First Life I have a bindery here in Amsterdam, which I've run since 2002. Yes, my bindery, at the moment part time due to the above mentioned baby, now 2 years. Mind your money. Of course it is fantastic to sell, but PLEASE pay attention to your prices. Are you going to be able to live from what you get? Keeping the balance of things. Making, creating is wonderful. Sitting behind the computer working on photos, mails, postings and research is fun too. Shopping for supplies is exciting. Working on an exhibition is a high for months. And being with the ones I love is unmissable. The only part I'm not too excited about is bookkeeping, which is why I have a super accountant that saves me from the bookkeeping stress every time. Recommended! Yes, at exhibitions and at my atelier. 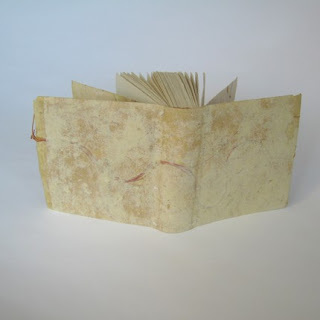 When seeing an exhibition of creative bookbinding in Estonia in 1995. My toolbox as a whole. Over the years I've collected many personalized tools that are irreplaceable! 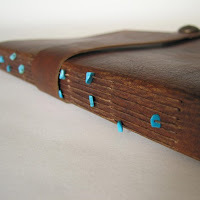 Paper, leather, wood. And others. Lovely interview. Nina, it is nice to read more about you and your work. Thanks for mentioning the issue of pricing. It breaks my heart when I see beautiful book that has been priced too low. 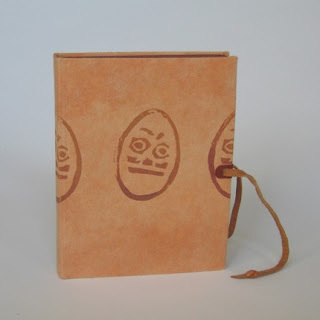 So many bookbinders are worth more!